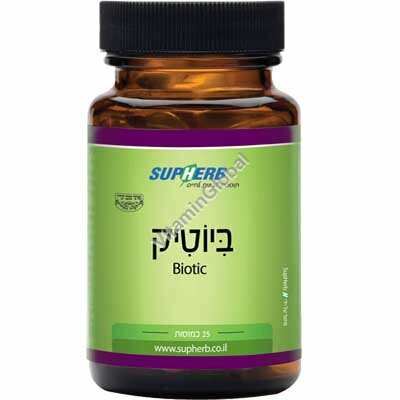 Biotic - A probiotic formula, especially developed for treating the damages caused by antibiotic treatment, for supporting and restoring the digestive system. Antibiotics are life-saving medications, but over-prescription of antibiotics causes numerous side-effects. The more prolonged the antibiotic treatment, the more severe the side-effects will be. Taking Biotic in combination with taking antibiotics and several weeks after antibiotic treatment has ended, will minimize side-effects, and reduce the need for re-using antibiotics. Soluble fibers derived from Sunchoke; These fibers create the conditions suitable for the thriving of probiotic bacteria in the intestine and in parallel, prevent the thriving of pathogenic (illness-causing) bacteria. A natural inhabitant of the human body, hinders and interferes with the activity of unwanted microorganisms by producing a natural antibiotic substance; improves breakdown and digestion of food. Improves digestion of Lactose by producing the Lactase enzyme. Improves immune protection and fights unwanted microorganisms, improves the activity of the digestivel system. Posses an especially high survival ability, restore the intestinal tissue and contributes to the improvement of the immune protection. Directions: 1-2 capsules a day approximately 2 hours after taking antibiotics. Should be separated by 2 hours from taking antibiotics. Available in packages of 25 capsules.